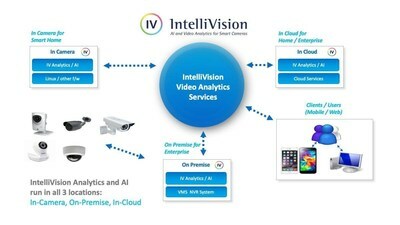 SAN JOSE, Calif., March 12, 2019 /PRNewswire/ -- IntelliVision Technologies Corp. (IntelliVision®), a pioneer and leader in artificial intelligence and deep learning video and audio analytics software for smart cameras and a subsidiary of Nortek Security & Control LLC (NSC), today announced it has been granted a patent by the United States Patent and Trademark Office titled "System and Method for Scalable Could Services," number US 10,142,381 B2. This technology of scalable cloud-based services is a key component of the IntelliVision video analytics service, which can also be deployed on the device or at the local server level. "As more and more IoT devices such as video doorbells and security cameras are integrated into the smart home and the enterprise environments, the need to manage millions of these devices becomes more urgent," said Vaidhi Nathan, SVP Cameras and Analytics for NSC. "This patent demonstrates that IntelliVision continues to be at the forefront of new technology for large-scale deployments of smart camera video analytics." "IntelliVision has been a pioneer in intelligent video and audio analytics technology and associated monitoring systems for over a decade with significant investment in R&D," said Nathan. "We are honored to receive this broad patent for our highly secure and scalable cloud system." The IntelliVision family of video analytics solutions includes object detection and classification (humans, vehicles, pets, airplanes), people/vehicle counting, demographics, intrusion/perimeter watch, object left/removed, license plate recognition (ALPR/ANPR), audio/sound recognition and face recognition. To learn more visit https://www.intelli-vision.com, email info@intelli-vision.com, or call 408-754-1690. Now a subsidiary of NSC, IntelliVision® is a market leader in AI and Deep Learning video analytics software for Smart Cameras, providing video analytics solutions for markets including Smart Home/IoT, Smart Security, Smart Retail, Smart Business, Smart City and Smart Auto (ADAS). IntelliVision video analytics products are in use in over 5 million cameras around the world and are used to provide actionable insights to home, business and security systems. IntelliVision provides the largest suite of video analytics products in the market today, with products used by Fortune 500 companies, the US Government and leading brands.